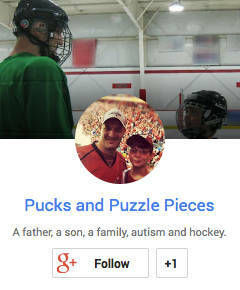 Ryan’s hockey team finished its regular season last weekend. There are still two weeks of playoffs, plus a weekend tournament to come, but the occasion still had me thinking back to how far he’s come. In October, 2011 I took Ryan to his first evaluations for the house league. This was his first chance to be on, as he put it, a “real team” after a couple years of clinics and half-ice scrimmages that served as his introduction to the sport. I sent him on to the ice that day in abject terror — mine, not his. I was so afraid that he wouldn’t be able to keep up or follow along. I feared he would get lost in the drills and be the worst player on the ice. The concept of someone who didn’t understand the challenges he had overcome — sensory, coordination, muscle tone, social deficit, attention deficit — just to make it on to that rink in full hockey gear scared me. I shouldn’t have worried. The evaluation was run by some of the same coaches who had worked with Ryan at those weekend clinics. They knew him well. He did finish last in a lot of drills. But he didn’t get lost. He came off the ice with a smile on his face. There was nothing judgmental. Next thing I knew, I was having “the talk” with Coach M — a person who has become one of the blessings in our lives. He accepts Ryan, encourages him and cheers his every success. Most importantly, he treats him the same as the other kids. I believe Ryan’s teammates take their cues from the coach, and they do the same. The first season had plenty of high points — but none better than Ryan’s first milestone puck. The team competed hard, but lingered near the bottom of the standings. Still, the season was an overwhelming success, and we looked forward to another year. Ryan finished last season with that lone assist in 20 or so games. A goal? It sounded like a tall order. Then there was that magical late-October Sunday, that began with Ryan scoring both his team’s goals in a 2-2 tie and ended with us on the sidelines at a Jets game. I don’t know that I’ve seen his self-confidence higher than in the moments following that hockey game. The two-goal outburst was followed by a scoring drought. But just when Ryan’s spirits were flagging, he found the scoring touch again and rediscovered his love for playing the game. A couple weeks later, it happened again. And this past weekend, he saved the best for last. With his team tied late in the third period of the next-to-last regular-season game, Ryan did what he does best. 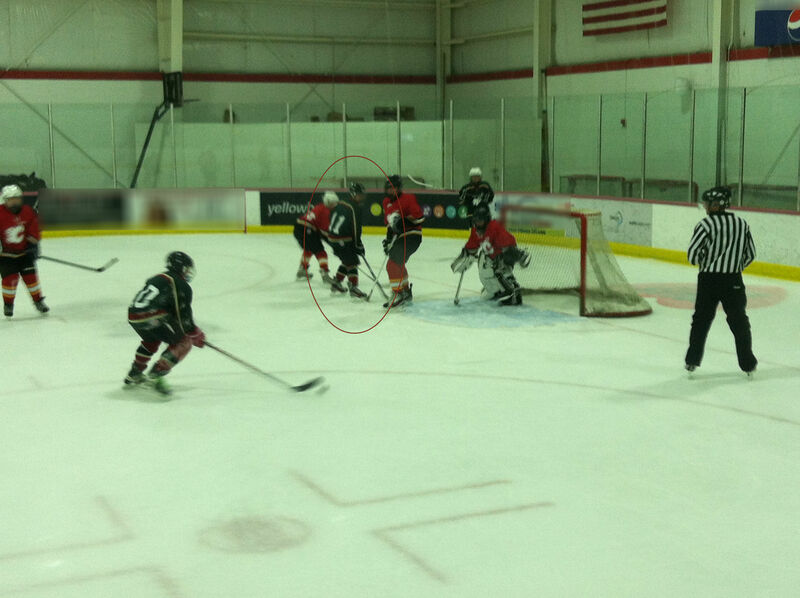 Reading the play, he pushed the puck ahead to a teammate and drove to the net with his stick on the ice. His teammate shot, the goalie made the save, and the rebound bounced right to Ryan. He buried it for his fifth — and most dramatic — goal of the season. All five were carbon copies: Ryan in the right place, at the right time, ready to pounce on a rebound. The longest shot was probably eight feet, the shortest perhaps six inches. No, this is not a copy of the first photo. 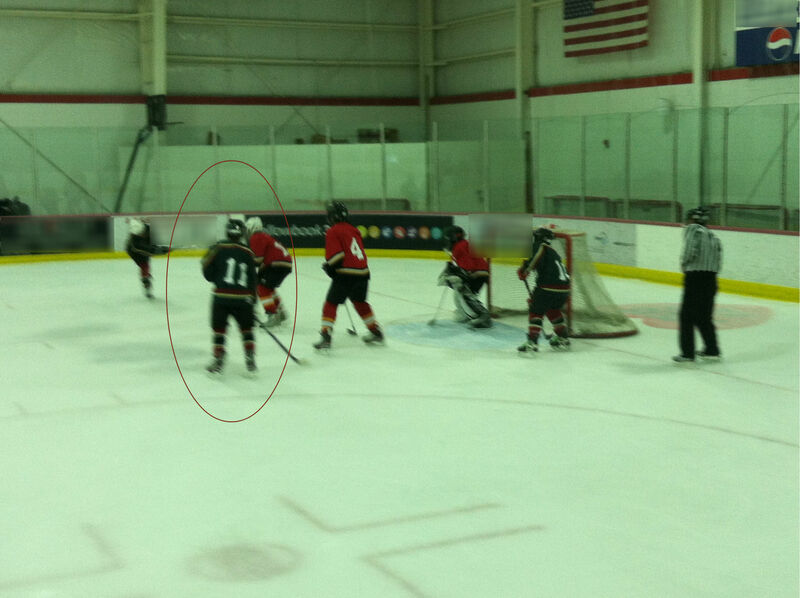 Ryan (#11) always sets up by the net and looks for rebounds. I find something appropriate in the symmetry of his goals. He is in the right place so often because of his repetitive — some might say obsessive — study of the game. Going to the net with his stick on the ice is a repeatable step that he has mastered. Ryan has managed to take a free-flowing, often chaotic sport, and break it down into a series of repeatable actions that have turned him, with little athletic skill, into an effective goal-scorer. He is what they call “coachable.” He does as instructed to the best of his ability and does not freelance. It’s no surprise Ryan approaches the game this way. It’s how he approaches everything, because that’s how his brain is wired. To see him have success at it is highly rewarding. The success hasn’t just been individual. Ryan’s team is excellent, having compiled a 13-2-3 record to finish in first place. The success hasn’t just been on the ice, either. At that first evaluation last season, I had to help Ryan with virtually every piece of equipment. By the end of the season, he was mostly dressing himself. This season, more progress: Ryan now does everything himself, including lace up his skates. I still have to tighten them for him, but most of his teammates also need some help with lace tightening. For a kid with his manual dexterity challenges, this is huge progress. The gear is full of straps that must be tightened and threaded through small loops. It’s like an O.T. session twice per weekend. I want to revel in the success, but I am still nagged by a fear of what comes next. Ryan moves up to bantam next year, and that means checking. He’s big enough to withstand some contact, but he also skates with his head down often enough that I worry about some opportunistic defenseman lining him up and driving his love of the sport right out of him in one hit. I know, I was once that big, opportunistic defenseman looking for kids with their heads down. I know what I need to do. Another talk with Coach M awaits. There are other options. I’m unsure of the right answer. I don’t want to think about all of that now. I want to watch Ryan go after another championship. I want to see him celebrate one more goal. I want to revel in the success. Like in so many other circumstances, I want to stop time, to preserve this moment where we’ve found a comfort zone in something that has provided so much joy and self-confidence. Stopping is time is not an option, of course, no more than it is for a team that is trailing late in a hockey game. I just have to do what Ryan does — go back to the repeatable steps that I know will lead to success. Seek out the right fit. Talk to all the people involved. Trust that my son can handle what comes and will surprise me at every turn. In other words, trust that he’ll go to the net with his stick down and that the rebounds will come. Beautiful – so much to celebrate. There’s so many good things that have come out of this. Being coachable? There’s a lot of kids who aren’t, but your boy is. Maybe all that early cartography has helped him to become someone who can read the play more intuitively than others? Anyway – a lovely post! Hang in there. Just continue to support and believe.